Dimensions: 8 1/2" x 11 1/2"
This classic work on Spanish-Colonial architecture is a superbly documented and illustrated account of the flowering of Spanish architectural style in the American South and West. It examines the elements of that style in detail as they arose in the traditional architecture of Spain and made their ways to America. The numerous detailed photographs and drawings vary from perspective views and detailed close-ups to measured front elevations and floor plans. 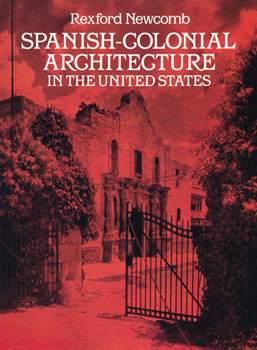 This remarkable study offers historians and lovers of art, architecture, design and Americana an indispensable source of authentic information on an architectural tradition of great character and beauty.